More About the AOI - The Association of the Oldest Inhabitants of D.C. The Association of the Oldest Inhabitants of the District of Columbia was founded in 1865 to foster pride in the nation's capital. Its formation came at a time when the post Civil War population was surging with government workers, returning soldiers, and refugees. The city was also plagued by lingering and divisive sectional loyalties. In an effort to restore the capital's dignity, 31 prominent Washington citizens and businessmen met in the Council Chamber of City Hall on December 7, 1865, to form the new organization. Its constitution and by-laws defined the association's purpose: "to keep alive the reminiscences of the past and the social and paternal communion of the present and the future." In addition, the constitution emphasized respect for local governmental authority and national patriotism above sectional differences. At the association's founding, a member had to be at least 50 years old and have resided in the District for 40 years. 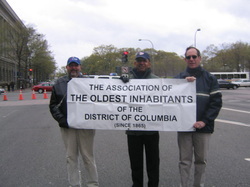 Charter members included Benjamin Ogle Tayloe, Peter Force, and John Carrol Brent.As the District's oldest civic association, AOI has been a strong supporter of many important city improvements and preservation projects, including construction of the District Building and the installation of modern city street lighting. In 1909, the District Commissioners, in recognition of the association's support for the city, passed a resolution allowing AOI to create a permanent meeting place in the old Union Engine Company building at 19th and H streets, N.W. There AOI shared the building with the Veteran Volunteer Fireman's Association, which had been granted use of the building in 1891 and had established a museum of fire fighting equipment and memorabilia. AOI met for the first time at the Union Engine Company on July 11, 1911 and continued to meet there until 1956, when the building was demolished for the construction of the International Monetary Fund headquarters. 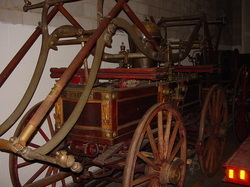 At that time, part of the valuable fire equipment collection was donated to the Smithsonian Institution and part to the Columbia Historical Society (now Historical Society of Washington), where the association subsequently held meetings. The organization has had many strong leaders, perhaps the most prominent being Theodore Noyes, owner and publisher of the Evening Star, who became president in 1908 and served for 35 years. To support civic improvement, AOI embraced the efforts of the Chamber of Commerce (later merged with the Board of Trade to form the Metropolitan Board of Trade) and became an early member of the Federation of Citizens Associations, founded in 1910. Over the years, preserving historic sites has been a major commitment of the organization, including the erection and maintenance of statues and memorials. Membership requirements for the association have changed with the times, and a major reorganization took place in the early 1990s. Since it began encouraging younger individuals particularly women and African Americans to join, the association has seen a resurgence in membership. (A parallel African-American organization, known as the Oldest Inhabitants, Inc., was founded in 1912, but is no longer active. Historian Nelson Rimensnyder continues conducting research to determine more about the Oldest Inhabitants (Colored), Inc.) and the Finding Aid to the papers of William D. Nixon at the Moorland-Spingarn Library at Howard University can been reviewed here. Currently, AOI members must be at least 40 years old and must have lived, worked, or operated a business in the District of Columbia for at least 20 years OR be descended from people who meet these qualifications -- Associate Members do not meet these qualifications but enjoy all of the benefits of membership except voting for by-law changes. The archives of the Association of Oldest Inhabitants, now preserved at the Historical Society of Washington, D.C.(HSW), span the entire 148-year history of the organization. Meeting minutes, correspondence, and newspaper clippings document the local civic issues in which the association has been actively involved. The Chronicler's reports, 1912-1933, are a rich source of information on local events of the period. Copies of speeches made at meetings cover a variety of topics of local history interest, including government, neighborhoods, businesses, and personal reminiscences. Biographies, obituaries, membership records, and individual and group portraits are valuable for biographical and family history research. In addition, the collection contains a variety of materials documenting the Veteran Volunteer Fireman's Association, including membership and dues records, correspondence, committee minutes, newspaper clippings, and photographs. Complementing the association's extensive archives are other Historical Society collections, including the papers of some of its active early members: Charles Glover, Theodore Noyes, Christian Heurich, John Clagett Proctor, and Jesse Suter. Many of the historic objects, photographs, and early manuscripts in the Society's collections were donated by members of AOI or were collected by the association for preservation. The Historical Society also holds archival materials of the Society of the Native Sons and Daughters of the District of Columbia, which was organized in 1920 by Jesse Suter, civic affairs writer for the Evening Star, and other AOI members to campaign for District suffrage and Congressional representation. That group disappeared in the early 1950s. Library research aids for the Association of Oldest Inhabitants Records and related collections are available in the Gibson reading room of Kiplinger Library at the Historical Society of Washington. by Gail Rogers McCormick, Former Vice-President & Library Director, Kiplinger Library, Historical Society of Washington, D.C.
1905 - 1908: Allison Naylor, Jr.
All officers are elected at the November luncheon meeting and serve until the following November. Among its goals, the AOI seeks to promote the L'Enfant, McMillan, Senate Park and the 2008 Framework (NCPC) Plans for the District of Columbia. 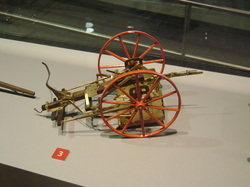 When the AOI distributed its collection of artifacts in 1968, the Smithsonian Institution accepted a patent model of a road scraper which is now part of the "America on the Move" exhibit at the National Museum of American History. 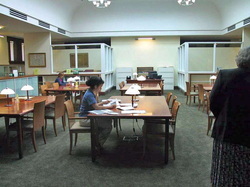 The Gibson Reading Room of the Kiplinger Research Library. Through grants, internships and donations to support the conservation of antique documents, maps and books, the AOI is a staunch supporter of the Kiplinger Research Library of the Historical Society of Washington, D.C. Since its founding on December 7, 1865, the AOI has been a promoter and supporter of public improvement projects for the District of Columbia, was a supporter of the creation of a District of Columbia Flag, continues to work to ensure that the city's road system conforms to the L'Enfant Plan even during this time of development and growth in the down-town business district and helps promote representation for District residents. 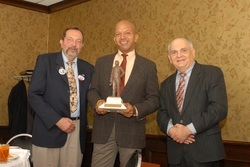 In November 2006, the AOI presented its first Governor Shepherd Award for Civic Improvements to Mayor Anthony A. Williams in recognition of his achievements to revitalize the District and its economic resurgence. The AOI has supported the award-winning District of Columbia flag since it was first designed in 1938 and has fought vigorously on several occasions to ensure that it iconic design was not tampered with to include slogans. In 2012, the AOI donated 15 sets of Patrick Reynolds' illustrated DC history books to ensure that all branches of the DC Public Libraries children's reading rooms had copies. 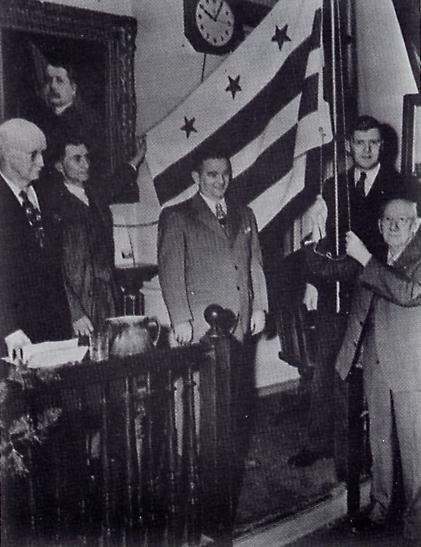 ​Read John Kelly's piece, "Birth of the DC Flag"
Since it was unceremoniously removed in 1972, the AOI has fought to have the USG Dunbar statue of Governor Shepherd returned to a place of prominence. In January 2005, after a peaceful protest to call attention to the cause, the statue was relocated from its 'temporary' home on Shepherd Parkway to its new home at the John A. Wilson (District) Building at 14th & Pennsylvania Avenue, N.W. Since its return the statue has been lighted, the AOI has placed a biographical plaque at its base and the D.C. Commission on the Arts and Humanities has had it cleaned and conserved. Many of these accomplishments could not have been possible without many local partners including the M.C. 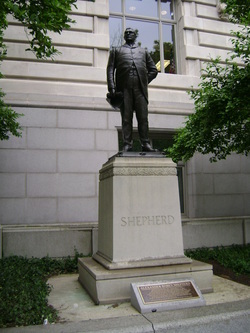 Dean Company (lighting), Gilford Corporation, Miller & Long Concrete Construction, Hutchison International-United Rigging and the Associated Builders & Contractors (rigging, hauling and relocating the statue), the D.C. Department of Transportation (coordination and site preparation), D.C. City Council Members Jim Graham and Jack Evans and Council Secretary Cynthia Brock-Smith.